"The Analysis of Infinitely Small Things" is a collaborative research project designed to examine and analyze the realm of the Infinitely Small. What things are so Infinitely Small that we do not notice them around us? Cracks, dust, and microbes? A candy wrapper, a curb, a shadow on a building? The sun and stars? The seminal text in the field of the Infinitely Small is a Calculus text called "L'Analyse des Infiniment Petits" (1696) by the Marquis de l'Hôpital. In order to begin a modern investigation of the Infinitely Small, kanarinka has transformed this text into a 200-foot-long scrolling guidebook bound in saran wrap with English instructions derived from the original French text. Using the scrolling, saran-wrap guidebook in addition to magnifying glasses, microscopes, and other field research tools, members of public expeditions scour the everyday environment for Infinitely Small Things. 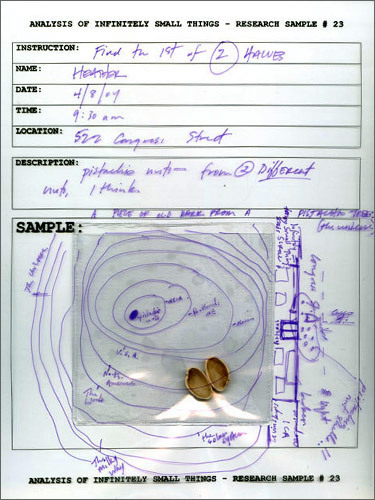 Participants carefully document and sample each Infinitely Small Thing using specially prepared research forms. Each research sample is later carefully digitized and published to this website in the catalog of samples. The website, www.infinitelysmallthings.net, contains a detailed analysis of the collected research samples. For 1:100, kanarinka will lead a series of public expeditions to find infinitely small things in the area around the DCKT Contemporary. kanarinka is a new media artist and curator. She is the co-founder of the non-profit collective iKatun and the Head of Technology for the WIDE World Research Project at the Harvard Graduate School of Education.